This week’s podcast is focusing on content writing and guiding your reader to the sale point. 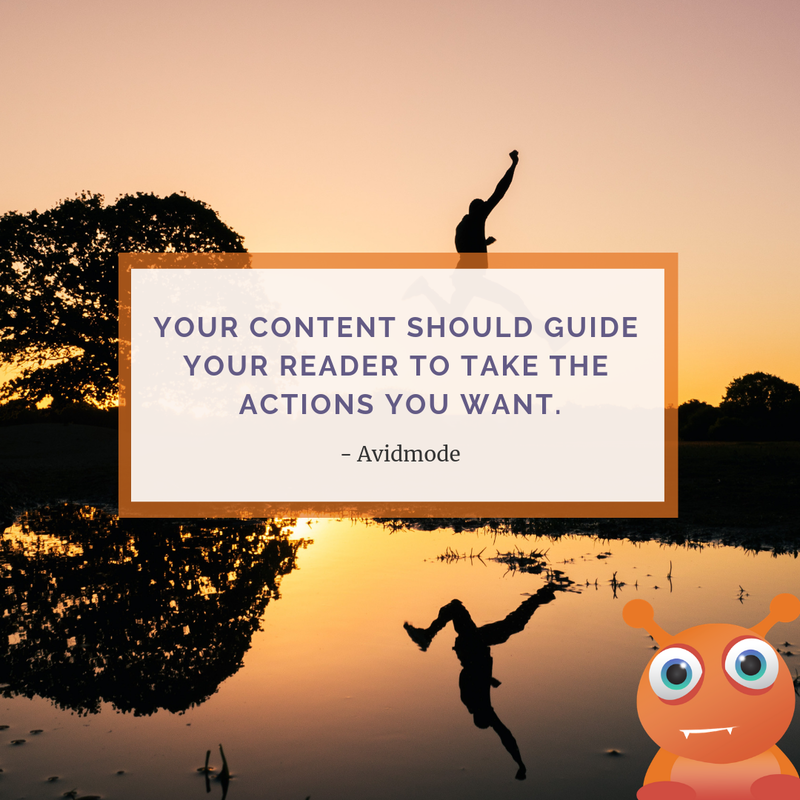 Hey guys, welcome to the second Avidmode podcast, this week we will be taking a look at how you turn your writing from a regular blog post to something that will entice your readers to buy from you which is obviously the main goal if you are writing for your business. When we’re writing content or doing any form of content marketing, we want to take people through a multitude of stages and guide them to our product or services. We are going to dive into this a little bit by explaining the points that you need hit to guide them through to purchase. Customers or buyers go through something that we call the buyer decision making process, this explains the route that a customer will take from A to Z before they’ve decided to buy your product. It’s been around for since the 1910s and still stands strong today. Amy is getting married in a couple of months and she has everything prepped except for the cake. She has come across the problem stage of the process. Amy decides she specifically wants to look at red velvet wedding cakes and as such, this is the main keyword in her search. There are multiple options available to her so she weights up the pro’s and cons of each of the cakes as well as the reputation of the companies and the pricing. This is the evaluation of alternatives stage. After much deliberation and discussions with her future husband, they come to a purchase decision and decide on the cheaper option with fewer layers on the cake but with better reviews. The final phase is post-purchase behaviour, Amy weighs up whether she made the right decision with the cake and if she has a positive experience it’s likely that she will recommend the company or buy from them in the future. So, you might be asking what impact this has on your writing as a content creator. Your goal is to get Amy to buy the cake (or whatever it is that you are trying to sell) and as the wielder of the pen or the keyboard, you have the power to see them every step of the way. Let’s take a look at the way’s that the cake business might try to entice Amy, probably doesn’t take much, because it’s cake but even so. As a customer, Amy will most perfect cake for her wedding. She’ll want to amaze people with a beautiful looking cake and at the same time want to scoff the entire thing herself. So, the first part of the article would include lots of pictures and at the same time a detailed introduction to your offering. Use lots of descriptive words and try to take Amy on a journey just by reading about the cake. For the information search section, you want to provide Amy with the ability to see what other people are saying about your product. It’s very unlikely that someone would jump to using your product solely based on a description, never mind how good it is. A great way to keep Amy interested is offering testimonials and reviews for her to look over. Once she hears recommendations from her information search that back up your testimonials, you’re looking positive. Always make sure these are authentic! The next section is where your call to action comes in, probably one of the most important parts of all content that you create. Send Amy to the page that she needs to be on to buy using persuasive, don’t be too formal and in this case, you might want to use emotive language, something that will tug on her heartstrings and make her think about how the cake will facilitate the most amazing day of her life. Finally, we come to post-purchase – although this won’t feature heavily as part of your sales content – Amys positive is priceless, so make sure that you end up getting that from her! Make them aware of your business and the problem they have that you can fix. It might be the case that your readers don’t even realise they have a problem that needs fixing – this is the case in all kinds of businesses, your company might have a solution that they never even thought about. So use this content as a way to showcase your product. Let the reader know why your product or service is better than the alternatives, what do you offer that they don’t, what are the benefits of working with you instead. Help them to understand why you have the solution. You can do this by talking about your experience with the product, perhaps you created as a way to fix your own issue – this will help the reader to connect with you as you’ve both struggled with the same issue. Help smooth the transition into the purchase by giving them a taste of the product or service, you can also offer discounts as another option. This is especially important if you are in a saturated market, for example – a coffee shop in the middle of a busy high street. Add value every step of the way, talk about your customer service offering, adding a human touch to the interactions can go such a huge way to help close the sale. Catch up with them after they’ve bought from you, ask how it all went. Be interested in trying to keep them as a future customer. Remember – these customers will become part of your marketing strategy, some of the best influencers in the world are those people closest to us. It’s more likely that you would trust the word of a person you know well over a complete stranger and in general as a business, you are a stranger. The key to all these points is to be persuasive, you don’t need to be overbearing or salesy but you do need to have good writing technique and the ability to plot out each individual point of your own customer’s buying process. As homework, have a think about your customers, what is their route to you at the end of the journey and how can you clean up the road a little bit to make the journey to you even easier? That’s all we’ve got for this week’s podcast, if you’ve got any questions, queries or you’d simply like to know more about writing for your blog then don’t hesitate to get in touch at our email hello@avidmode.com, we’d love to hear from you! Thanks for listening and we will see you again next week where we will be talking about using visuals in your social media marketing!